Both Smooth haired and long haired Chihuahua care is really very simple. The long haired Chi requires obviously more grooming than the smooth haired type. These long haired Chi should have a daily brushing, you may want to brush your smooth haired type as well, they both love the added attention. Caring for each Chi type is basically the same right down to the clothing you buy them. What Does Clothing Have To Do With Care? Wondering what clothing has to do with Chihuahua care? 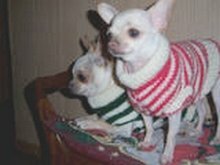 The truth is clothing (not so much about how cute they look), during harsh weather offers your Chihuahua protection. For instance, during the winter, your Chi does not grow a coat like the larger breeds, such as the Huskys do to protect them from the cold. Therefore, to keep your dog comfortable when you take him out, dressing him in a sweater or jacket will help him maintain warmth. In addition, dog clothing can also help to keep the coats of long-haired Chi free from dirt and mats when they go outside to play. Take a closer look at each so you can see the benefits they have to offer. Stop dogs from getting wet during a rain storm. Most Chi don’t like their coat getting wet. Bright coats can help make your dog visible to others in bad weather, and from a distance. Keeps the dog warm during the cool months of early spring and fall. They are comfortable and easy for your dog to wear. They come in many designs so you can find some great looking sweaters to suit all of the holidays if are interested in your Chi making a fashion statement. Boots protect his feet and legs from cold weather, harsh terrains, hot asphalt, snow, ice, mud, thorns, sharp rocks, etc. Absorbs the shock of walking and cushions the amount of force being inflicted on the leg. This is a great feature, especially when you consider that Chi are prone to knee problems. Insulates and warms a large part of their feet as well as the muscles and joints in the legs. Properly clothing your dog is an important part of Chihuahua care. Clothing keeps him well protected, content and comfortable in harsher climates, allowing him to happily enjoy his walks all year round, rain, snow or shine!